A public hearing will take place on Thursday, November 9th, 2017 at 7:00 p.m. regarding 2018 Preliminary Budget & Community Development Block Grant. Joint Town Board/School Board Meeting Agenda 10-30-17 - Note 6:30 p.m. start time. Friday, October 27th, 5:00 p.m. - Regarding 2018 Budget. A joint Town Board/School Board meeting will be held on Monday, October 30th at 6:30 p.m. at the Town Hall Courtroom. A public hearing is scheduled for Thursday, November 9th at 7:00 p.m. regarding the 2018 Preliminary Budget. A Grand Island Town Board workshop is scheduled for Monday, August 14th. See agenda. Monday, July 17, 2017 . . .
A motion was made to appoint John Good of Derby, NY to the position of code Enforcement Officer at CSEA Grade 8 Start, which is $26.67 per hour, effective July 18, 2017. The Town Board approved awarding a bid to Robinson Paving for the bituminous resurfacing of various Town roads at the lowest bid of $272,336.00. A local law amending the Town Code to "provide requirements for accessory uses in business zoning districts on contiguous parcels" was referred back to the Town Board for further review. In the public comment section of the Town Board meeting, Nancy Tobe submitted 50 signatures in favor of keeping the Golden Age Center at the Whitehaven Road Nike Base. Another GAC member, Pat Akinbami, said she and many others were in favor of keeping the GAC at the Nike Base because it had easy access, parking, warmth & charm, "like a country retreat." At a workshop held earlier Monday, a Broadband Feasibility Study was presented by Matt Crider. The project would increase the performance for Town Government buildings along the "Baseline Road Backbone", a 11 mile stretch from the Water Treatment plant at the north end to Ferry Road at the south end. Talks are in the works for the Grand Island School system to possibly participate,which would then share the cost of the $424,000 project. If the project goes through, the fiber optic lines could allow more internet carriers to offer services and could also be a positive for new business development on Grand Island. Approved the Recreation Department to transfer a list of employees to their seasonal pay rate, effective July 18th. Approved an application for a block party and street closure at 431-470 Park Place, on Sunday, August 27th from 3pm-7pm. Monday, July 10, 2017 . . .
A cerificate of appreciation was presented to retired Town Code Enforcement Officer Doug Learman, for 30 years of public service. Later in the meeting, Supervisor Nate McMurray announced that Doug was being re-hired to a seasonal position to help transition current projects and eventual new hire. The Town Board approved signing a formal contract with Telecom Data Services to provide the Town with a new phone system at "little to no cost", In lieu of payment, Telecom Data Services will take the savings the Town will receive in switching to the new system. The Town Board also approved signing a contract with Telecom for internet services. This will include better bandwidth and a high-speed fiber network connection to the Town Hall. The cost will be less than the new price structure of Spectrum. An amendment to the Scenic Woods Trail Project, located between Ransom and East River, for a $9500 increase to the budget was approved by the Town Board, The total revised budget is now $61,800 and includes $16,800 for permitting and the elimination of survey costs of $7300. The professional services contract is with Barton & Loguidice, D.P.C. A resolution was approved authorizing an agreement with the New York Sate Department of Transportation for the Grand Island Blvd. Accessibility Project. The project is to install sidewalks on Grand Island Blvd. from Webb Road to Fantasy Island. The cost is 1.3 million, with 80% of the funding coming from the federal government. Grand Island has to pay 20% or $260,000, which will be appropriated from the 2017 capital budget. The contract specifies that the project must be complete within 18 months time. Special use permits were renewed for: Gail Villani, 5302 East River Road: 1 agrictultural animal; Christopher Taylor, 1693 Grand Island Blvd. : Used Car Sales. A special use permit for a public display of fireworks at 3709 East River on July 15, rain date July 16 was approved. It was announced that Barbara Wilson retired on June 30 from the Golden Age Center after 20 years of service. A certificate of appreciation will be presented. Barry Conway has been hired for a part-time position in the Golden Age Center kitchen. The center is short staffed as the last two hires left shortly after being hired. Approved a bid by Polydyne, Inc. for the puchase of polymer for phosphorous removal at the Grand Isalnd Wastewater Plant. The cost is $ 0.79 / pound. A Town Board Workshop is scheduled Tuesday, July 11th at 4:00 p.m. - 7:00 p.m., re: Executive Session - CEO Interviews. The Town Board's Regular Meeting and Workshop have been changed from July 3rd to Monday, July 10th. The Workshop will begin at 5:00 p.m. and the Regular Meeting will begin at 8:00p.m. 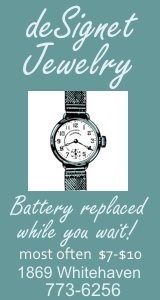 Monday, June 19, 2017 . . .
A public hearing titled "Accessory Uses in Business Zoning Dirstricts on Contiguous Parcels" had no public comment and was referred back to the Town Board and the Planning Board for further review. The site plan for an addition of a Boiler Room at ThermoFisher, 3175 Staley Road was approved by the Town Board 4-0, with Councilman Mike Madigan abstaining, because he works for the company. Scenic Woods - Bicentennial Park Phase II involves the construction of this multi-phase project's primary stone dust trail, from the area of Gun Creek to the waterfront of the Niagara River, Installation of boardwalks and rest areas, placement of interpretive signage and mile markers. The Board approved the filing of an electronic Consolidated Funding Application through the NYS Office of Park, Recreation and Historic Preservations' Park Development Program for no less than 50% of the approved funding. Final plat approval was given to a new, small subdivision at Love Road and Alt Blvd. The project will be six lots: three-5.10 acres, two-6.78 acres and one-92.72 acres. The special use permits for the Grand Island Solar project on land by I-190 and Bedell Road were approved. The plan would make the 18-acre project the largest in New York State, with 13,000 solar panels. The electricity would be marketed to the community. A local law amending the Town of Grand Island code regarding the appointment of committees and liaisons was dropped, after positive discussions between the Supervisor and members of the Town Board. A more even distribution of liaison positions was achieved. At the end of the meeting, the board suspended the rules to approve the hiring of Clark, Patterson, Lee to conduct a feasibility study for a community center, at no charge. They also approved the hiring of Victoria Brown for a PT position with the Golden Age Center. Authorized Town Engineer John Whitney to advertise for bids for Wastewater Treatment Plant Polymer and for the resurfacing of various town roads. Authorized Supervisor Nathan McMurray to sign a Professional Services Agreement for Sanitary Sewer Evaluation Survey Year 6. Approved the permit for Fireworks at Fantasy Island for July 4th festivities. Approved a long list of seasonal hires by the Parks Department and Recreation Department. Approved the hiring of Margaret Kowalik, PT for the Golden Age Center. Agenda 6-19-17 - 8:00 p.m. Workshop 6-19-17 - 3:00 p.m. Workshop 6-19-17 - 6:00 p.m.
From left: Councilmen Chris Aronica & Ray Billica, Sarah Swagler, Supervisor Nathan McMurray, parents Barb & Scott Swagler, Councilwoman Bev Kinney and Councilman Mike Madigan. 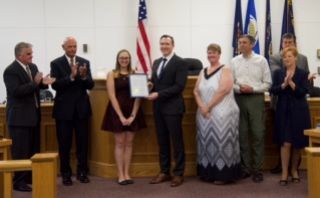 Monday, June 5, 2017 . . .
A proclamation was presented to Sarah Swagler, recognizing her recent earning of the Girl Scout Gold Award. The Gold Award is Girl Scouts highest award and requires a significant project, much like the Boy Scouts Eagle Award. 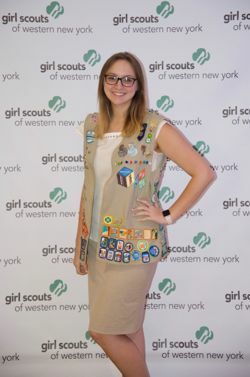 Sarah's project included collecting over 5000 books for the Seneca Babcock Community Center in South Buffalo, creating a book exchange. Congratulations Sarah. A public hearing regarding a resolution for the increase and improvement of facilities of the consolidated sewer district was passed 5-0. This will provide funds to fix the sink hole that formed on Whitehaven Road, at an estimated maximum cost of $300,000. The public hearings on two solor projects were tabled after input from a member of the Conservation Advisory Board made some points regarding stripping the land of all vegetation. Citing the I-190 as being the single largest pollutant on Grand Island, Mr. Ron Rezabek suggested a high hedge could be used as a pollution control mechanism. The board voted to table the public hearings and refer to the Conservation Advisory Board for input. The Board voted to adopt a resolution introduced by Councilwoman Bev Kinney to adopt a standardized solar permit process for residential properties. This form would be filled out by contractors and be located on the Town website. A $2500 grant will be received from the NYS Energy Research and Develolpment Authority for participating. 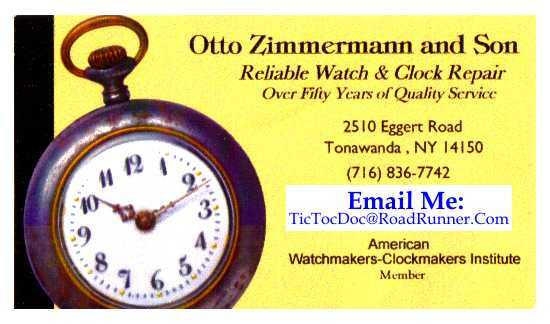 A request by Mike Madigan to send a letter to New York State DOT and Parks regarding "the neglect/lack of appropriate mowing frequency on both Parkways", was approved with the suggestion that the letter be edited with an action plan and a request for a meeting. Copies will be sent to state senators and legislators. A local law amending the Town of Grand Island code regarding the appointment of committees and liaisons was introduced by Madigan. This would transfer appointment power from the Town Supervisor individually, to the Town Board as a whole. In the past the Town Board divied up the different boards by discussion. Supervisor McMurray now removes and appoints at will, leaving some Board members with no liaison posts. Bev Kinney would like all the advisory boards to way in on the issue. The resolution was tabled for further discussion by the Advisory Boards and the Town Board. A bond resolution for the reconstruction and improvements to various roads was approved by the Board at a maximum cost of $1,000,000. See road list. The Board approved a request for the Town Supervisor to sign an agreement for Greenway Funds for the Scenic Woods/Bicentennial Park project, to include construction of trails in phase 1 and 1A of Scenic Woods and a trailhead parking lot. An item discussed at the end of the meeting, in a "suspend the rules" section, discussed the request by the Conservation Advisory Board to create two sub-committees. One would be a "Forestry Committee", to address the issue of replacing the many ash trees being removed. The other committee would address "Preservation and Restoration of Shorelines and Streams." It was decided that the July 3rd meeting would be rescheduled to Monday, July 10th. Accept with regret the retirement of Joanne Snyder from the Golden Age Center, a certificate of appreciation will be sent. Gave the Golden Age Center authorization to advertise for a replacement recreation attendent. Agenda 6-5-17 - 8:00 p.m. The next Town Board workshop meeting will take place on Tuesday, May 23rd at 5:00 p.m. at Town Hall courtroom. 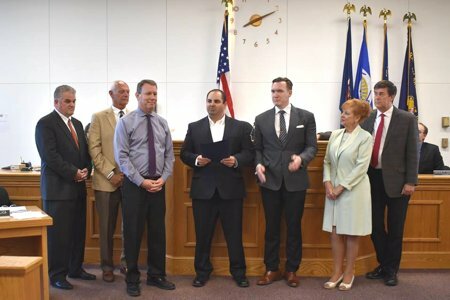 From left: Councilmen Chris Aronica & Ray Billica, Marty Allen, Recreation Supervisor Joe Menter, Supervisor Nathan McMurray, Councilwoman Bev Kinney and Councilman Mike Madigan. Monday, May 15, 2017 . . .
A proclamation was given to members of the Golden Age Club in honor of the month of May being designated as Older Americans Month. 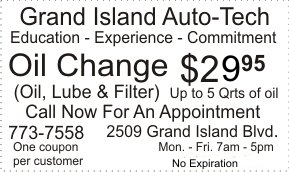 In part, it read "Grand Island is committed to helping all individuals live longer, healthier lives." 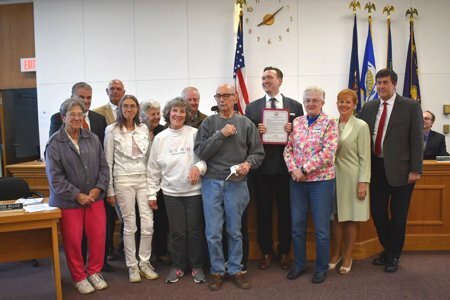 It went on to say the Town Board gives "thanks to the Grand Island Golden Age Club for its many years of service to Grand island's older Americans." The second proclamation was given to Grand Island School District Band Conductor Mary Allen for his 29 years of service and as conductor for the Memorial Day Ceremonies for 25 years. The Town Board "expresses heartfelt thanks to Marty Allen on his passionate dedication to our music program and for helping keep the true spirit of Memorial Day alive." Assistant to the Superivisor Cyndy Montana has resigned her position, effective June 2, 2017, and has announced she will be running for a Town Board seat this fall. The Town Board approved Emily Wynne as her replacement with a title change to Secretary to the Supervisor. From Town Engineer John Whitney: A bid was accepted by Amherst Paving for the Ferry Road Waterline Reconstruction project in the amount of $164,242.00. A request to hire Ty Gallagher as a seasonal full time employee at the Waste Water Department was approved. A request to authorize the Supervisor to sign a professional service agreement for the Water Plant Rehabilitation project was approved. Approved the bid of BIDCO Marine Group to perform Water Treatment Plant intake cleaning and inspection at a cost of $10,450.00. Approved a bid by BIDCO Marine Group for Wastewater Treatment Plant Outfall Cleaning & Inspection at a cost of $8,900.00. A change order request by Recreation Supervisor Joe Mentor in the amount of $4,189.68 was approved, for the additon of two dedicated pickle ball courts at Havenwood Courts. A large number of Recreation Attendents were approved for the summer season of the Recreation Department. The Parks Department also received approval to hire four seasonal employees. A vacant dwelling, located at 2041 Baseline Road should be demolished and removed according to Code Enforcement Officer Ron Milks. It has been vacant since 2008 and is in danger of collapsing. Three separate charges have resulted in fines being levied, but the owner has stated he has no intentions of doing anything with the building. The Town Board tabled the request to make one more attempt with the owner. Rules were suspended to address the issue of a sewer collapse at Whitehaven Road and the Water Treatment Plant. Funds will be made available to fix a sink hole, not to exceed $300,000. Approved the change of use for property at 2920 Grand Island Blvd. to be used for CrossRiver Ministries as a church. Approved a vehicle display area to be positioned at the front of SCAP, 1939 Grand Island Blvd. There will be a public hearing on June 6th for a special use permit for a Community Solar Array Project at 126 Industrial Drive and 2411 Bedell Road. Two parcels with a total of 18 acres will be used for the project. Agenda 5-15-17 - 8:00 p.m.
Workshop 5-15-17 - 6:00 p.m. The next Town Board meeting will take place on Monday, May 15th at Town Hall. Beverly Kinney was absent from the meeting. Supervisor Nathan McMurray announced Joe Menter has been made a permanent appointment as Recreation Supervisor after getting a 95% on the Erie County Civil Service Exam. A Town Technology Oversight Committee has been formed, which will oversee the final touches to the website and the daily and overall maintenance of the website. Judy Schmidt will be the chair of the committee and delegates from the Technology Advisoty Board will be appointed to make up the committee. Town Engineer John Whitney has requested to hire Ryan McDonald as laborer, seasonal full time, for the Water Department. Whitney also recommended that the Town accept the low bids to purchase topsoil from Leo Brenon Topsoil at $19.45/yard and use Bull's Concret Construction at $6.50/sq. ft for flat work concrete repairs. The Town Board approved the request by Town Assessor Judy Tafelski to appoint Michael Samland as an alternate to the Board of Assessment Review. Local Law Intro #1 of 2017 - Agricultural Animals in County-adopted, State-certified Agricultural Districts was approved 4-0. This law states "neither an agricultural animal permit nor a special permit for the keeping of agricultual animals shall be required". Approved signing a contract with NYS Office of Parks Recreation and Historic Preservation to supply water/wastewater service to Beaver Island State Park at a rate of $4.16/1,000 and $8.98/1000 for sewage. Approved the hiring of six seasonal Parks Department employees. The next Town Board meeting will take place on Monday, May 1st at Town Hall. Ray Billica was absent from the meeting. The public hearing regarding Agricultural Animals in Agricultural Districts was closed. In the draft, "neither an agricultural animal permit nor a special permit for the keeping of agricultural animals shall be required" in Agricultural Districts in the Town. The final draft is being forwarded to the Planning Board. The Planning Board had stated at their April 10th meeting that they did not recommend approval of the proposed law. A request by McGowan Productions to host a lunchtime Food Truck Friday at Town Hall was approved by present Board members. The event will start on Friday, June 16th, for eight weeks, between the hours of 11am-2pm, subject to event permit requirements. Picnic tables and garbage receptacles will be placed on the lawn. A request by the Engineering & Water Resources Department for bids on parking lot improvements at the Waste Water Treatment Plant was approved. Numerous summer hires were approved. Water Department: Seasonal Full Time-Sean Steckelberg, Engineering Intern: Nathan Busch (2nd year), Recreation: Adam Heftka (3rd year). In addition, Parks Maintenance:17 seasonal hires were approved. A planned 16 unit apartment building at 2984 Grand Island Blvd. by David Mazur was tabled pending a SEQR. Supervisor Nathan McMurray proposed a year long moratorium on apartments and asked Town Attorney Peter Godfrey to draft a local law. In the public comment session at the end of the meeting, local contractor Dan Drexilius made allegations and called the Grand Island Highway Department "criminal". He alleges that boats were stored in a parking area behind the Highway Department garage and were shrink wrapped by equipment possibly bought with taxpayer funds. Drexilius said, Easter weekend people were shoving "things" into his mailbox to tell him about these things, and employees are afraid of retribution. He also announced he was running for Highway Superintendent, had the endorsement of the Conservative party, and this was not a "political act". Response by Highway Superintendent JT Tomkins. A special use permit renewal was approved for Arlene Clark of Second Avenue for a Home Occupied Barber Shop. Accepted the resignation of Golden Age Center employee Susan Quagliana and hiring of replacement Irma Sanchez. The next Town Board meeting will take place on Monday, April 17th at Town Hall. The Town Board approved a resolution to continue the process of acquiring funds to complete a Town Municipal Agricultural and Farmland Protection Plan. The Town will apply for financial assistance from the NYS Department of Agriculture and Markets Program and commit to providing no less than $1,667, required to apply. The application for grant funds, in the amount of $25,000, will allow the Town to enter into a project agreement with NYS. This program allows for a wide range of services, see Q & A here. The Town Board approved the construction of the new Veterans Park Pavilion, adjacent to the concession stand at the park. The Town will purchase the material for $15,000 and a group of volunteers will build the structure. Approved a resolution to Establish Energy Benchmarking Requirements for Certain Municipal Buildings. These will measure a building's energy use, tracking that use over time and compare the performance to similar buildings. See resolution. A public hearing will be scheduled for April 17th on the draft Local Law Regarding Agricultural Animals in County-adopted, State-certified Agricultural Districts. This only affects permits in the Ag. Districts. Approved a quote from Blue Ox to replace the Veterans Park concession stand roof in the amount of $22,813.00 for a metal roof, with the caveat of Engineering Department checking on the need to do a tear off of current roof. The Town Board suspended the rules to approve the expansion of a dug out at Veterans Park at Grand Island Little League expense. Re-Approved the Final Plat for the Gun Creek Subdivision, located off of Whitehaven Road. Approved Recreation Department employees Sharon Szafran and Dominique DeGregorio to transfer from part time to full time for a period of five months. Approved the hiring of Cynthia Wynne and Julie Klein as Recreation Attendents. Approved the hiring of the following at the Parks Department; Michael Dollard, Joseph Killian, Ryan Ayers, Samuel Calao, Linda Tufillaro and Clifford Smith. Approved an employee status change requested by Golden Age Center Director Barbara Gannon. Approved special use permit renewals for Carol Merckel, 2324 East River Road, Glen Wallace, 917 North Colony Road and a new application by Jonathan & Jennifer Conta, 2420 Love Road. The next Town Board meeting will take place on Monday, April 3rd at Town Hall. A special use permit was approved for a home occupation of embroidery, silk screening, fabric and sports apparel by Jonathan & Jennifer Conta of 2420 Love Road. Supervisor Nathan McMurray introduced the establishment of a local law, for a nine month moratorium of special use permit requirements, in Agricultural Districts. The measure was approved by a vote of 3-2, McMurray, Madigan & Kinney in favor, Billica and Aronica against. A 40x100 foot pavilion will be built just west of the concession stand at Veterans Park. The Town will purchase materials from Len-Co Lumber at a cost of $14,919.32. A group of volunteers will erect the structure at no cost to the town. A resolution introduced by Councilman Mike Madiga,n to eliminate special use permits for agricultural animals in Ag Districts, was not approved (3-2), Aronica, Billica and Sharpe against. Agreements with Teamsters Local 264 and the CSEA were approved. Approved the appointment of Jennifer Mentor as FT recreation leader at the senior center. Approved the hiring of Jeffrey Riha as Parks Sr. Worker-seasonal. Approved the hiring of Denise LaBarre and Susan Quagliana as PT recreation attendants at the senior center. Approved the appointment of the Town Board with Supervisor McMurray as chair, to develop an RFP for a proposed Town Community Center. The next Town Board meeting will take place on Monday, March 6th at Town Hall. Councilman Ray Billica was absent from the meeting. Councilwoman Beverly Kinney introduced Local Law #1 to Regulate Solar Energy Facilities. The law has been in the works since last year, with input from the Town Board, Planning Board and town Attorney Dan Spitzer. Kinney noted that special use permits will still be needed for all of the commercial enterprises and there are minimum acreage restrictions. The law was approved 4-0. See Solar Law. The public hearing regarding a bond resolution for water treatment plant improvements was approved 4-0. Another public hearing is scheduled for March 6th for a bond resolution regarding improvement of the consolidated sewer district. The signing of a contract with Erie County to accept funds to update the Grand Island Master Plan was tabled for further review. During the public comment period, Doug Learman of the Zoning Department spoke of being cyber bullied by an Island resident and inflamatory "news" blogger. The Grand Island Town Board will hold a workshop on Monday, February 13, 2017 at 6:00 p.m. See agenda. Approved a change order for additional work on the Ferry Road Waterline Improvement project at a cost of $5,580.97. Approved the split/merge of a lot on Meadow Lane between neighbors Richard Hosmer and Joseph D'Agostino. Approved a request to split property at 1725 Grand Island Blvd. for tax billing purposes was approved. Approved the renewal of a special use permit for a dog kennel on Alvin Road. Approved tower permit renewals for Bedell Road Bikepath and 3078 Staley Road. The next Town Board meeting will take place on Monday, February 6th at Town Hall. A public hearing is planned for Monday, February 6th at 8:00 p.m. for a bond resolution to increase and improve the facilities of the consolidated water district/water treatment plant. A change order was approved in the amount of $4,680.50 for Ferry Road Waterline improvements. The Town Board accepted with regret and certificate of appreciation the retirement of wastewater treatment plant operator David Hamlin after 39 years of service. Approved hiring John Palaszewski for the wastewater treatment plant operator position. Thanks to Council member Bev Kinney and the Cable Communications Advisory Board for their work in recovering $67,540 from Charter (previously Time Warner) for underpayment of fees. There is a workshop on Monday, January 23rd at 5:30 p.m. at Town Hall for miscellaneous agenda items. Approved the special use permit renewal of Robert Mesmer, 2548 Love Road for private airport/landing strip/residential, rural area. Approved site plan and issued SEQR for David Mazur, a mini-self storage facility at 2549 Whitehaven Road. Appointed Greg Butcher as Deputy Emergency Services Coordinator. The next Town Board meeting will take place on Tuesday, January 17th due to the Martin Luther King Jr. holiday. A half a dozen residents spoke in favor of the removal of the bike path area by South Lane, for trapping permits on public lands. Councilman Ray Billica introduced the change after walking the area and talking to local residents. The first meeting of the year concerns the reorganization of the Town of Grand Island. A list of 45 items were accepted by the Town Council, including Advisory Board and Liaisons appointments.